India Gate is located in Rajpath and was the first gate to be constructed in the New Delhi. It was built as a War Memorial to commemorate the death of 90,000 India soldiers, who were killed in the North West Province during the First World War and the Afghan Fiasco of 1919. The Duke of Connaught laid the foundation of this Memorial on 10th February 1921. The India Gate was designed by Sir Edwin Lutyens and was completed in 1931. The gate is built of sandstone rising to a height of 160 ft. the height of the arch is 136' externally and 87'6" internally. India Gate is constructed as a memorial and was built in the memory of 90,00 soldiers who laid down their lives during world war I. Located at Rajpath, India Gate is 42 m high and is popular relaxation area during the summer evenings. India Gate also act as popular pinic spot during winter. 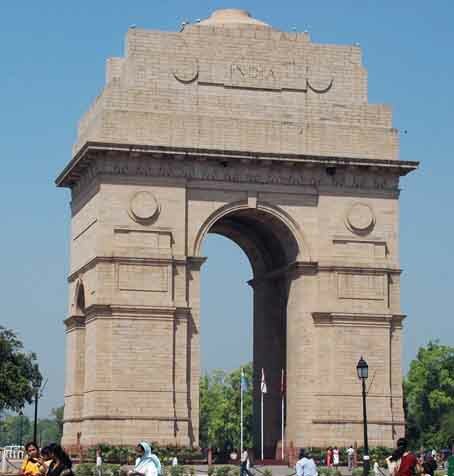 Also known as the All India War Memorial, India Gate was designed and constructed by Lutyens. 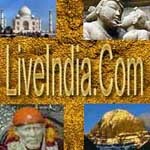 He was the who is considered the chief proclaimer in designing the New Delhi plans. Straight down the road from Rashtrapati Bhavan is this landmark, a 42-meter high arch War memorial built in memory of innumerable soldiers who laid down their lives during the Afghan war and World Wars. A flame, Amar Jawan Jyoti, is kept perpetually alive here. The stretch of lush green lawns spreading from here is a major crowd puller. It bears the name of the 85,000 Indian Army Soldiers who died during the wars. Below the arch is the memorial to the Unknown Soldier. India Gate, the majestic structure, is set at the end of Rajpath, perhaps the most beautiful area of New Delhi with plush green lawns in the backdrop. Designed and built by Lutyens, it was originally called All India War Memorial in memory of the Indian soldiers who died during the Wars. The names of all the soldiers are inscribed on the walls of the structure. An eternal flame called Amar Jawan Jyoti that runs on gas was lit in 1971 to honour the martyrs. A tour of Lutyens’ Delhi just has to kick off with the stately India Gate at the east end of the broad Janpath (earlier Kingsway) that leads to the Rashtrapati Bhawan. Another additional 13,516 names engraved on the arch and foundations form a separate memorial to the British and Indian soldiers killed on the North-West Frontier in the Afghan War of 1919. The foundation stone was laid by HRH the Duke of Connaught in 1921 and the monument was dedicated to the nation 10 years later by the then Viceroy, Lord Irwin. Another memorial, Amar Jawan Jyoti was added much later after India had said goodbye to its imperial rulers. It is in the form of a flame that burns day and night under the arch to remind the nation of soldiers who perished in the Indo-Pakistan War of December 1971.